Shown here is the class painting at Bushnell Farm in Old Saybrook, CT. Learn how to paint or further your ability with watercolor, oil and acrylic art lessons from PJ Cook. Lessons will help you explore design, color, value, textures and patterns. We will have discussions, demonstrations and critiques to improve your paintings. 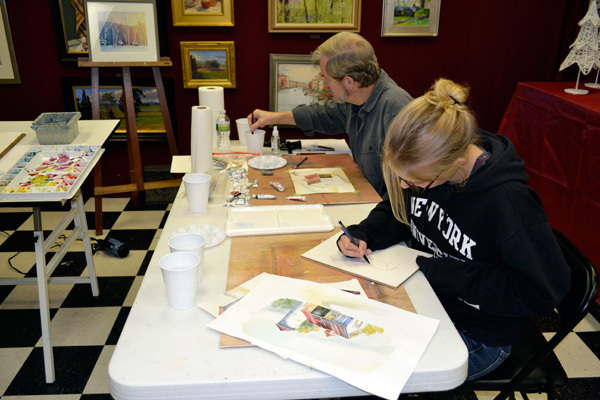 These art lessons will be informative and fun with a stress-free approach toward painting. Art Lessons can be on location at scenic areas along southeastern Florida during the winter months and shoreline areas of Connecticut during the summer. Lessons can be private with one student or with a small group. If there is a special painting technique or a problem you are having in your paintings PJ will help you improve using professional demonstrations. 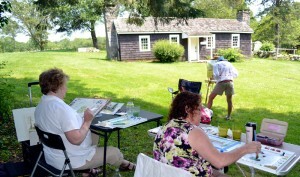 Painting lessons being held indoors in Old Saybrook, Connecticut. You will learn how to create depth using gradations , mix colors using a limited palette and how to charge paint to add color to your paintings. Each class PJ will show step-by-step with illustrations of the painting process emphasizing a technique for making a good painting. For beginners there are discussions on materials with recommendations from PJ’s 30 years of painting experience. Also how to mix colors and for watercolor how much water to use on the paper and with your brush. These are techniques that are necessary for a successful painting. Currently lessons are offered in southeastern Florida through the winter months and Southern New England during the summer. I offer private or group lessons. For more information simply use the form on the contact page and we’ll respond immediately.